Takes you back to the Home screen, lets you access the application’s Options or the main functions you need to manipulate your photos. Cancels your last action on your photo. Prompts you to save your retouched photo. Prints your original or retouched photo on paper. Displays the alterations you have made to your photo in the preview window. 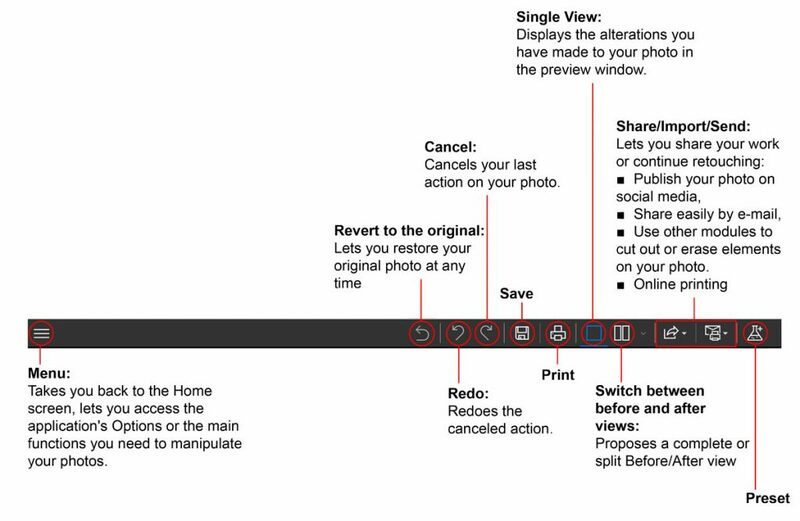 Switch between before and after views: Proposes a complete or split Before/After view as shown below. Use other modules to cut out or erase elements on your photo. By default, the workspace displays your photo in a Single view. The alterations you have made to your photo are displayed simultaneously in the preview window. Choose one of the views proposed on the view options toolbar to better judge your retouching work in the photo. Displays a precise zone of a photo. The navigator also lets you move around in the image and display the desired zone in the workspace. 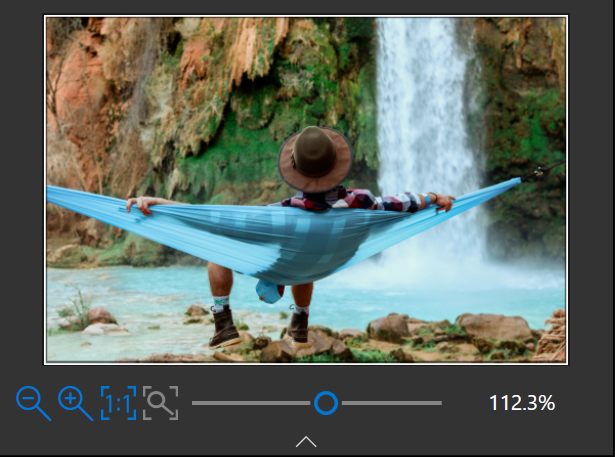 The zoom options let you adjust the amount of zoom to let you view the desired zone: a global view or a detailed view of your photo. Displays all the images in a folder and opens them in the workspace. Lets you add directories to Favorites so that you can find them quickly. Sets the display order of the photos in the filmstrip. You can sort them by Name, Date or Size. 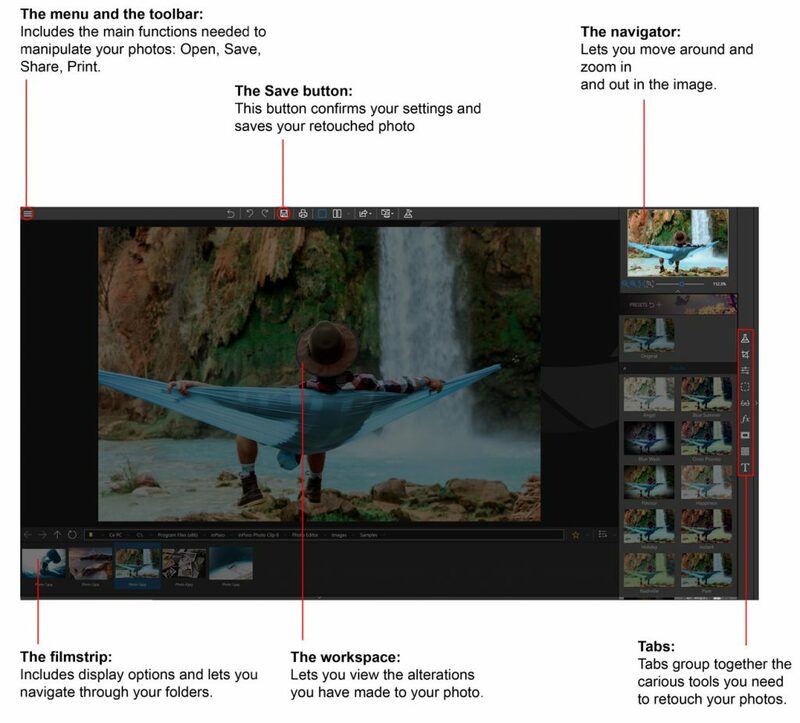 The tabs let you open different modules to retouch your photos.